a house that is bigger than the buyers parents home. After all, air space doesnt cost more when the land and materials are cheap and unsuitable for quality homebuilders." To date, the CPSC has received about 810 reports from residents in 23 States and the District of Columbia who believe their health symptoms or the corrosion of certain metal components in their homes are related to the presence of drywall produced in China. State and local authorities have also received similar reports. We received our first incident report from a consumer on December 22, 2008. 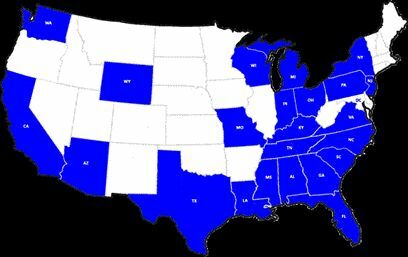 The majority of the reports to the CPSC have come from consumers residing in the State of Florida while others have come from consumers in Alabama, Arizona, California, Georgia, Indiana, Kentucky, Louisiana, Michigan, Mississippi, Missouri, New Jersey, New York, North Carolina, Ohio, Pennsylvania, South Carolina, Tennessee, Texas, Virginia, Washington, Wisconsin, Wyoming, and the District of Columbia. An estimated 800 homeowners in Charleston County have defective trim on their homes, making some eligible for money to replace it through a class-action settlement. How do you know if your home has defective trim? Charleston attorney Paul Dominick said the ends of the boards are soft to the touch, indicating rotting. Other signs are chips, bulges or cracks.Also, homeowners can ask their builders if they used the product, which was sold under the names TrimBoard, ChoiceTrim, ProTrim or Trim from Louisiana-Pacific Corp. Most was installed between 1994 and 2004. The Nexsen Pruet law firm has set up a local hot line: 843-720-1736. This Defective House was not quite 7 years old when these were taken. "We started to suspect we had a problem because the rooms inside developed a musty smell - we traced the smell to around the electrical outlets, so we knew it was something inside the walls. We could not see any leaks, but a moisture meter did detect moisture in the walls at multiple spots. You can see that due to multiple construction defects (including defective stucco, incorrect window installation, and improper grading), the house was literally rotting to pieces beneath an exterior that appeared to be fine. Not even our contractor expected the damage to be as extensive as what they found." Bad Stucco.com is dedicated to highlight the problems within the building trades concerning stucco, as well as providing informational resources about proper stucco application. We take photo contributions from all sources and seek not to point out individual offenders, but rather to raise the consumers awareness level so tha they can be on guard against he problems in their new house. Feel free to browse our directory of pictures (or contribute your own). A house is such a huge expense now days and it is a sin that poor workmanship, improper texhniques and just plain greed can set new homeowners up for a nasty surprise a few years down the road. Photos: Pampered Foundations Common and careless errors that can have grave consequences for a homes foundation. Common Foundation Defects Will todays foundation last? Water drips from Air Conditioner on 220 Electrical Conections of water heater causing fires! San Antonio Express News agrees ith HOBB: Editorial: National Electric Code must be city's code, too. "The council should adopt the national standard. 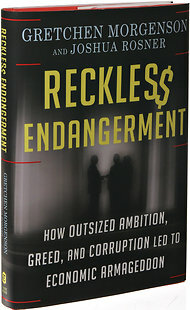 This is an area where its uniqueness makes San Antonio's leadership look dangerously complacent. " Builders in the NewsAC placement fuels hot fight By David Anthony Richelieu Express-News Staff Writer. The City Council is expected to resolve a dispute today over whether the stacking of air conditioning units over electric hot water heaters should be allowed to continue in new homes and apartments. "....the city has a moral obligation to change a potentially dangerous practice, adding that it was only a matter of time before a water heater short circuit would trigger a larger fire and put people's lives at risk." Press Release HomeOwners for Better Building. Over the course of 9 years rain water penetration of this home incurred thousands of dollars in water damage, necessary and unnecessary repairs. A major contribution at the delay at finding the corrective action to stop the rain water penetration was the inexact nature of the three home inspections. 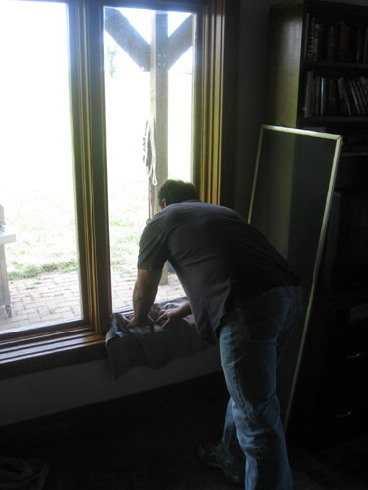 View the issue at and spread the word about these windows. Seeking others with this same problem from the highlighted manufacturer. Reducing theFire Hazards in Aluminum-Wired Homes,methods, research, experience, expert sources. This document answers most technicalquestions about the hazards and remedies of aluminum electrical wiring. Aluminum Wiring Update: CPSCreiterates unsuitability of twist-on connectors (Including the Ideal No. 65) for repairing aluminum wiring in residences. 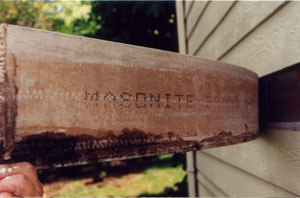 May 25, 2001 Masonite Drops Hardboard Siding A rash of class-action lawsuits against manufacturers of hardboard siding has saddled the material with a reputation for buckling, swelling, and other moisture-induced problems. Those chickens now appear to be coming home to roost. Citing a 40% decline in hardboard's overall market share in the past five years, the Masonite Corporation has stopped production of all hardboard siding products. Masonite Siding Settlement Assistance. If you need help with your siding settlement see this website. It has information about ALL siding settlement and informaiton to help homeowners apply. Examples of ABTCO siding on Centex homes in San Antonio, TX. July 28, 2000 Added to Construction Defects: A copy of the PROPOSED ABTCO siding settlement . Also review HOBB opposition to the settlement. HomeOwners for Better Building objects to the proposed national ABTCO siding settlement . " A Review of the ABTCO Hardboard Siding Settlement by John R. Cobarruvias "
Defective Hardboard Siding Information Center If you are experiencing rotting, warping and general failure of your hardboard siding, welcome to the Defective Hardboard Siding Information Center! Either you or someone you know is having a problem with hardboard siding on a home, condo, apartment or mobile home, and you need information. So did I a few years ago, but it wasn't until January 1998 that I began using the Internet as a research tool. This site is designed to provide information to homeowners and builders about hardboard siding. The Settlement of the Investigation of Masonite Corporation and International Paper Company by the Florida Attorney General Jun, 1998. "Within thirty (30) days of the execution of this Settlement Agreement by both parties, Masonite shall deliver to Florida International University a check in the amount of SIX HUNDRED THOUSAND DOLLARS ($600,000) made payable to Floridas International University Foundation, Inc."
Masonite Hardboard Siding Settlement The official site for the Masonite class action lawsuit settlement affectiong approx 4.5 million structures in the United States. Masonite Omniwood Siding/Woodruf Roofing The official site for yet another Masonite class action lawsuit settlement. Lousiana Pacific Siding Official settlement page. Better than the Masonite page. Georgia Pacific Siding Official settlement page. EIFS FACTS. eifsfacts.org. The BEST site about synthetic stucco. Synthetic stucco hearing set today 12/08/00 ROY L. WILLIAMS News staff writer The Birmingham News. " Nearly 25 Shelby County homeowners are suing Dryvit System Inc., a maker of synthetic stucco, which argues in court documents that it is protected by the doctrine of caveat emptor - buyer beware . " Homeowners sue over synthetic stucco siding By BILL MURPHY Houston Chronicle. "Wheeler and a dozen others allege that synthetic stucco is a defective product. They have sued such manufacturers as Finestone, Dryvit and Corev America. 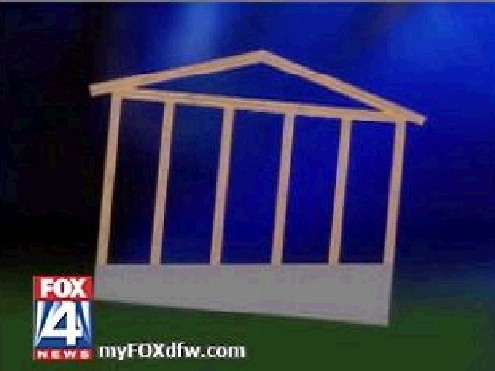 An additional six homeowners filed suits in Harris County just last week." DATELINE INVESTIGATION Is your home crumbling around you? Itís happening to new homes across the country ó find out more from a ëDatelineí investigation NBC NEWS March 22 ó You spend a lot of time looking, do all the legwork, invest your heart and soul in it, not to mention your savings. And finally, you own a piece of the ìAmerican Dreamî ó your own home. But what if the brand new house you worked so hard for begins to crumble around you? Itís happening to new homes around the country. Is it just a case of, ìthey donít build ëem like they used to?î Or is there more to the story? Chief consumer correspondent Lea Thompson reports with a ìDatelineî Investigation. Rotting walls prompt ban on use of stucco. Raleigh forbids building with synthetic stucco until January. Officials will set new standards by then. BY MATTHEW EISLEY, Staff Writer RALEIGH -- The City of Raleigh has imposed a moratorium on synthetic stucco on wood-frame buildings because of evidence that it makes walls rot. "It is not in the citizens' interest to continue with a product that is suspect," said Raleigh Inspections Director Ed Owens, who notified home builders last week of a moratorium to last from May 1 until January. Synthetic Stucco Home Page GAHI Georgia Association of Home Inspectors. Another good source of info. "GAHI is leading the industry with the latest information and testing on the growing problems with EIFS. Check our site often for the latest developments and the best links on the internet." A Detailed Look at Synthetic Stucco Problems Synthetic stucco is basically a type of foam sheeting glued and nailed to the structural sheathing (usually plywood) on the exterior of a home. This material has a factory- or field-applied fiberglass mesh installed over the outer surface which is then finished with two or more coats of the stucco-like material. First Synthetic Stucco Lawsuit Filed in Maryland The law firm of Cohen, Milstein, Hausfeld & Toll, P.L.L.C. has filed the first synthetic stucco lawsuit in the state of Maryland. The case, alleging that the plaintiffs' townhouses were damaged by synthetic stucco, was filed in the City Court of Baltimore on December 30, 1998. The lawsuit asserts that synthetic stucco manufactured by Sto Corporation and/or Dryvit Systems, Inc. was defectively designed. Because the synthetic stucco was installed without a drainage system, it has caused water to be trapped between the walls of the townhouses and has caused significant damage. Welcome to the Information Page for the Ruff v. Parex Class Action Lawsuit and the Senergy and Thoro Settlement. f you own a residence with synthetic stucco exterior wall cladding, your rights may be affected by a class action lawsuit and proposed partial national settlement now pending in court. The Settlement covers: All persons or entities who, as of May 15, 1998, own or owned a one or two family residential dwelling or townhouse in the United States clad with Senergy, Inc.'s or Thoro System Products, Inc.'s EIFS System. EIFS: Special Report From Builder Online. Exterior Insulation and Finish Systems, EIFS for short, can provide a handsome, low-maintenance, water-resistant cladding -- when applied correctly. But when applied incorrectly, EIFS can become a wood-rotting machine, sealing in moisture that eats away at the home from the inside out. Homeowners sue builders over stucco Two families in a Weaver Dairy Road subdivision join the furor over synthetic stucco, take the manufacturers and a local custom builder to court. By David Schulman, Staff Writer CHAPEL HILL - Two local homeowners say they got more than gracious architecture with their custom-built $500,000 houses in a Weaver Dairy Road subdivision. Concerns raised over stucco product By Michele Derus of the Journal Sentinel staff November 28, 1998 As Wisconsin copes with newly discovered decay problems among 4,000 homes sided or sheathed in wood-composite products, synthetic stucco is emerging as the latest allegedly defective building exterior. $550,000 house may be bulldozed By ANNA GRIFFIN Staff Writer The Charolette Observer. Sometime soon, a demolition crew could arrive to tear down Anna Marie and Alan Nelsen's new home. The house, which they bought for $550,000, is less than five years old and offers stunning views of Lake Norman and The Peninsula Club golf course. But private engineers say it would cost up to $400,000 to make it safe for occupancy. Synthetic stucco, real damage By Leonora LaPeter Savannah Morning News The siding's tendency to trap water and not let it out leads 23 area homeowners to file suit; at least 3,000 more owners of wooden homes could face damage from the material. Qest® Polybutylene If you have Qest® plastic water pipe in your boat or recreational vehicle, or if Qest® was installed in your home either before 1978 or after July 1995, you may have a claim for money damages against U.S. Brass in its bankruptcy case and the right to vote on U.S. Brass' payment plan. The Spencer Class Action covers homes that were plumbed inside using polybutylene plumbing systems with polybutylene pipe connected with acetal plastic insert fittings. The polybutylene pipe is usually grey or black plastic. The acetal insert fittings are usually grey and occasionally white plastic. There are a variety of other fitting systems used with polybutylene pipe, but only the systems with grey or white plastic insert fittings shown below are eligible for reimbursement under the terms of the Spencer Class Action. Oct 20, 2000 Added to Construction Defects: Furnace alert in Calif. Consumer agency warning about gas units. "The U.S. Consumer Product Safety Commission is warning Californians about a brand of forced-air gas furnaces that may pose a fire risk." Aug 15, 2001 www.windowsettlement.com A class action lawsuit was filed in the District Court of the State of Minnesota for the County of Hennepin called OíHara v. Marvin Lumber and Cedar Company, and Marvin Windows of Tennessee, Inc., Court File No. 00-14027. 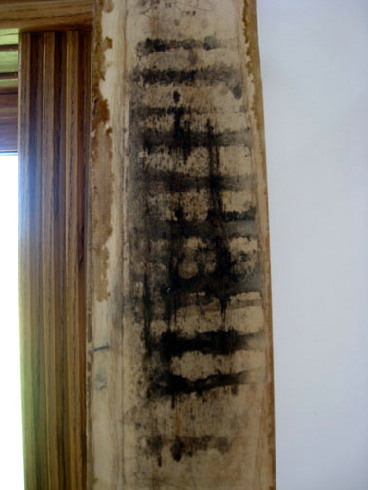 Plaintiffs sought damages in connection with the premature wood rot of Marvin doors and windows manufactured between 1985 through 1989 and treated with a defective wood preservative, commonly known as PILT. Jan 23, 2000: Posted in Construction Defects: FireFree Tile of Quantum Panel Roofs settlement. (roofing tiles I believe.) www.firefreeclaims.com . Nov 24 2001 Proposed settlement of Debbie Read et al. v. James Hardie Building Products Inc. No. 00-2-17945-65EA King County, Washington Superior Court concerning roofing shakes such as HardiShake and HardiSlate among others. See www.hardieroofingclaims.com for more information. 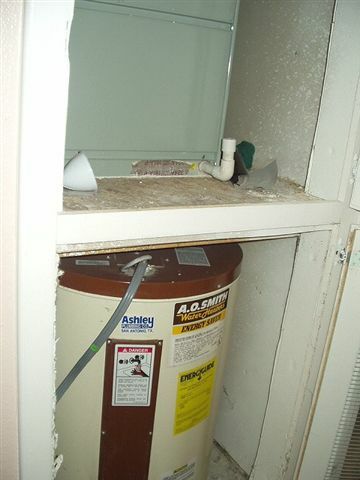 Mar 28, 2000 Added to Construction Defects : All persons throughout the United States who have owned or currently own a water heater manufactured by Rheem Manufacturing Company, A.O. Smith Corporation, Bradford White Corporation, American Water Heater Company, Lochinvar Corporation and State Industries, Inc. (the "Tank Manufacturers") that contains a dip tube manufactured, supplied or sold by Perfection Corporation ("Perfection") between August 1993 and October 1996 ("Subject Dip Tube"), and said water heater or dip tube was purchased prior to September 8, 1999.